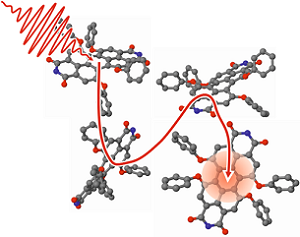 Our group investigates photoinduced processes in molecules, supramolecular structures and organic materials by time resolved spectroscopy. The goal is to observe and characterize the occurring fundamental steps and to learn about the responsible mechanisms. Molecular systems exhibit a huge variety of features and phenomena which can be explored in a broad spectrum of applications. A microscopic and quantum-mechanical understanding of the molecular processes is the key to design and optimize the properties of the systems.